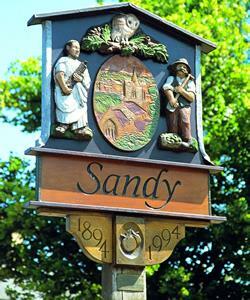 Set against a backdrop of greensand hills with their parkland, woodland and heath is the town of Sandy, once the centre for market gardening. The 14th Century Church is dedicated to St. Swithun. Within the Church stands the statue of Captain Sir William Peel, who is reputed to have thrown a live shell back at the Russians during the Crimean War. He was one of the first recipients of the Victoria Cross. Sandy is also the location for the Tourist Information Centre. For further details about Mid Bedfordshire and the places on the Scenic Route, call into the centre at 5 Shannon Court, High Street, Sandy.